Another day trip suggestions for those staying on Holy Island, (also relevant for other visitors to Northumberland) is to spend a day visiting the Sycamore Gap on Hadrian’s Wall, a World Heritage site that’s well worth a visit. You can go any time of year (I took the pictures below in January, hence the snow). It does take 1.45 hours to get there (or two, if you take the scenic route, which I’d recommend), but if you don’t visit Northumberland often, this is a great opportunity to see the Wall. 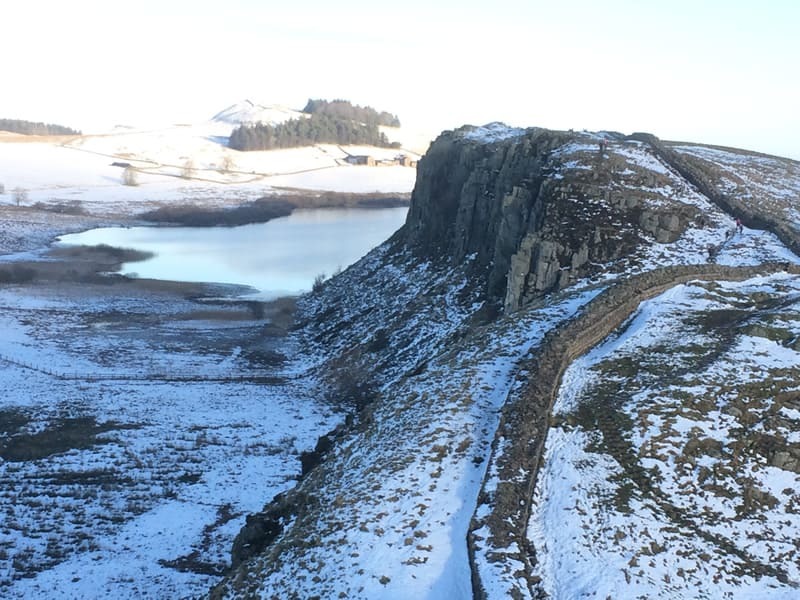 Whether you are a fan of history, Game of Thrones (Hadrian’s Wall was the inspiration for The Wall in GOT), or you’d like a beautiful day out with some old stuff thrown in, this day trip has it all. Hadrian’s Wall marked the northern edge of the Roman empire, and runs across the width of England for 73 miles from sea to sea, starting by the North Sea east of Newcastle and ending to the west of Carlisle by the Irish Sea at the Solway Firth. There’s an official walking trail along it that takes about seven days to complete, but you can also visit it at interesting points, walk for a bit and have a nice lunch. Sycamore gap with its iconic tree that looks like the logo of an Amazon Kindle, is one of the best places to see the wall. 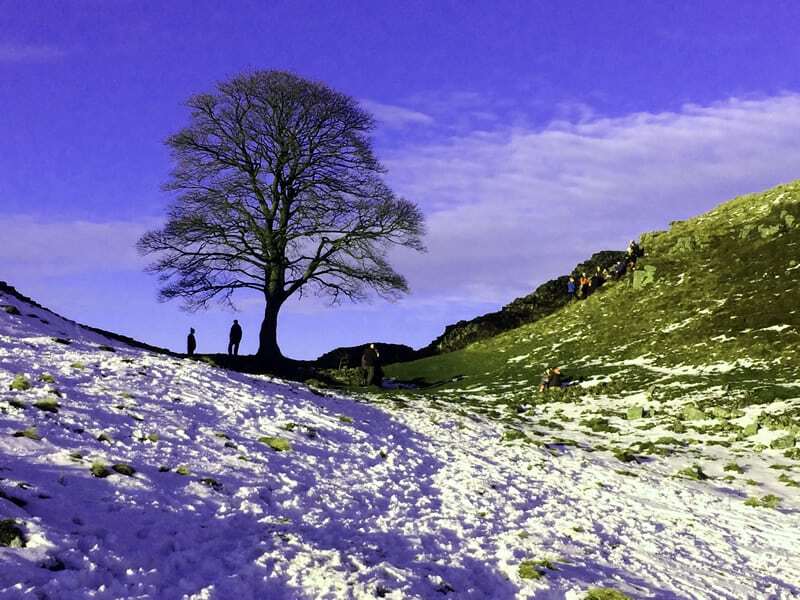 The tree at Sycamore Gap is one of the most photographed in the UK, and winner of the English Tree of the Year Award for 2016. 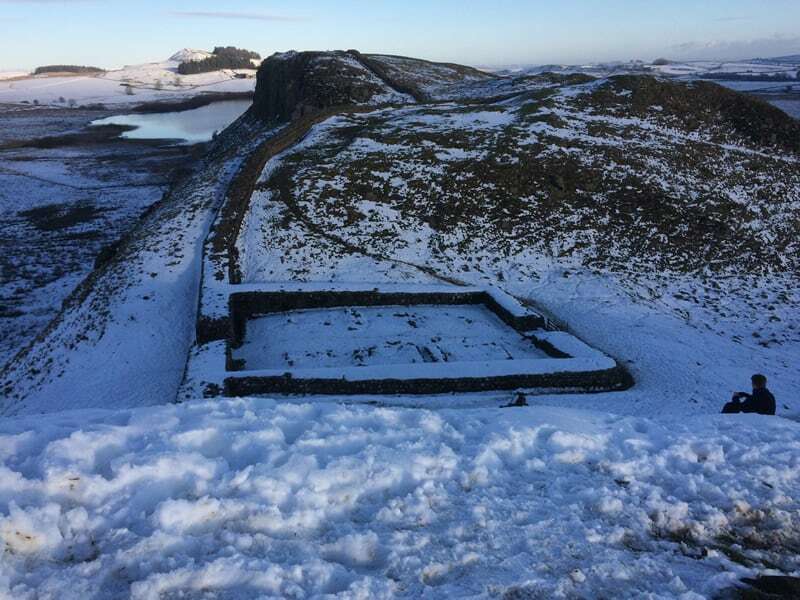 Just to its left is Milecastle 39 (‘Castle Nick’), one of the many guard posts along the wall. If you’re driving from Holy Island (or coming from the North), the quickest way to get to the Wall’s Sycamore Gap is via Newcastle, but this isn’t the prettiest way. For the price of a slightly longer (by about 15 minutes) journey, you can take the beautiful scenic route by setting your satnav or map to Cambo first (NE61 4BE) and once there to The Sill visitor Centre (NE47 7AN). You can either park at the Sill car park (costs us about £3) or park along the road (number 68) that leads up towards the walking route (you’ll see other cars parked there). Another option is the Steel Rigg car park a little further up the number 68 road (haven’t parked there, so not sure, but on the map it looks closer, though it doesn’t have the visitor centre’s facilities). If you do park at the Sill, the parking system is based on licence plate recognition, and you don’t need a ticket in your car window, just park and pay at the machine before you leave (correct as of Jan 2018). The idea is to get to the visitor centre at the Sill, have a coffee or lunch there and then go for the circular route along a short stretch of the wall, which takes 2-3 hours, depending on how far you go (or do the walk and then have the food, or both…). From the Sill visitor centre, walk straight up the 68 road until you hit the signs for the wall (you will be heading East, or to the right of the road). You’ll likely see other visitors heading that way, so it’s hard to miss. Follow the signed path along the wall to the Milecastle and then the Sycamore Gap itself, a short way beyond it. You can carry on further as much as you like, but bear in mind that you’ll be turning back and walking the same distance to get back to your car. On the way back, if you don’t want to double back up along the wall, you can take the dirt road that leads all the way to the 68 main road. Level of difficulty: moderate, if you’re walking along the wall, with a slight climb and some steep inclines. In winter it can get very boggy, muddy and slippery. For a more accessible path you could take the dirt path right from the 68 road to the Sycamore path, though it’s probably not wheelchair friendly (there was a trough blocking the road when we visited).